Our prices are among the lowest we checked. These are printed using quality stock and inks. Our Pizza Box Toppers are so cheap many people resell them for a profit. You wont believe some of the markups that many companies charge for Pizza Box Topper printing. 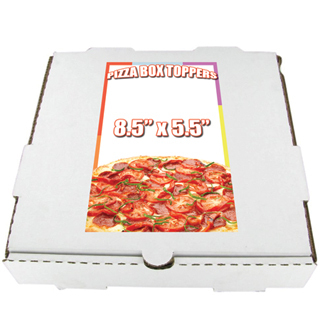 We do not just claim to have the lowest prices on Pizza Box Topper Printing. We search our competitors in effort to offer you these pizza box flyers at the cheapest print prices available. If you need cheap pizza box topper flyer printing but are concerned about using only quality materials I would like to put you concerns at ease. Our Toppers are printed on 80lb or 100lb Gloss Paper to give your images a great looking shine and added protection. These are alot better than 70lb stock that many pizza parlors use and at a better price. If you need design services for your Pizza Box Toppers our design staff can help bring your next promotion a lot of success. Copyright © 2015 CheapPrintPrices.com, Buinesscardsflyersbanners, Inc. All rights reserved.